Temperament: Highly intelligent, trainable, active dog. Alert and occasionally vocal. Height: Three sizes: standard, over 15 inches up to and including 17 inches; miniature, over 13 inches up to and including 15 inches; and toy, up to 13 inches. 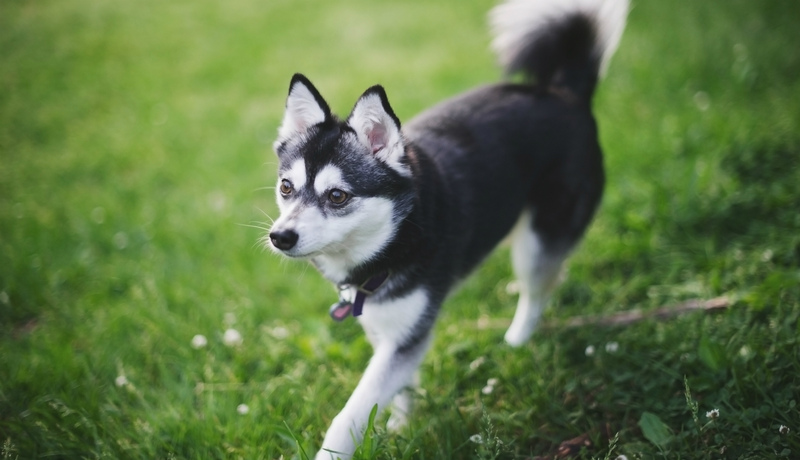 The Alaskan Klee Kai was developed in the 1970s from a rescue named Curious who was believed to have been bred from a purebred Husky and a mixed breed dog. The Spurlin family developed the beginning of the AKK breed from this initial rescue. Other dogs used in the production of the breed included Siberian and Alaskan Huskies, a Schipperke and an American Eskimo Dogs. The Alaskan Klee Kai (AKK) was officially recognized by the American Rare Breed Association (ARBA) in 1995 and by the United Kennel Club (UKC) in 1997. AKK occur in three size ranges: 1) Toy - ?13 inches; 2) Miniature - >13 inches and ?15 inches, and Standard - >15 inches and ?17 inches. AKK have been found to be doing a good job at present maintaining heterozygousity within the breed. Alaskan klee kai's are fairly closely clustered together genetically. When compared to modern day village dogs, AKK would be considered products of full-sibling matings, with substantial loss of breed-wide diversity. They have been found to have a severe bottleneck with low average alleles and effective alleles found within the tested population (Na of 4.788 alleles per locus and a mean Ne of 2.620 alleles per locus resepctively). All of the DLA found in AKK have been found in other breed. At present, 11 different STR-associated DLA Class I and 8 DLA Class II have been found. This is a fairly typical number of DLA compared to other breeds. This breed has low levels of genetic diversity due to its small number of founders. AKK breeders should work to maintain the diversity that they have at present to avoid future health problems and loss of breed viability. This is achieved by breeding for higher OI than breed average (.37) lower AGR than breed average (-.01). They should also strive to breed for lower IR to reduce homozygousity (breed average .01) in their litters. Some consideration should be made to increase any rare DLA types in the population when possible as well as breeding for heterozygousity in DLA.